Click on any image to enlarge it - click image again to reduce it. 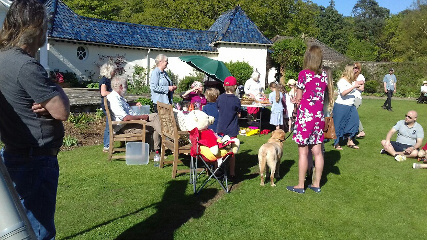 What a glorious day Hazel & her team had at Stody Open Gardens Kids for Kids fun day. 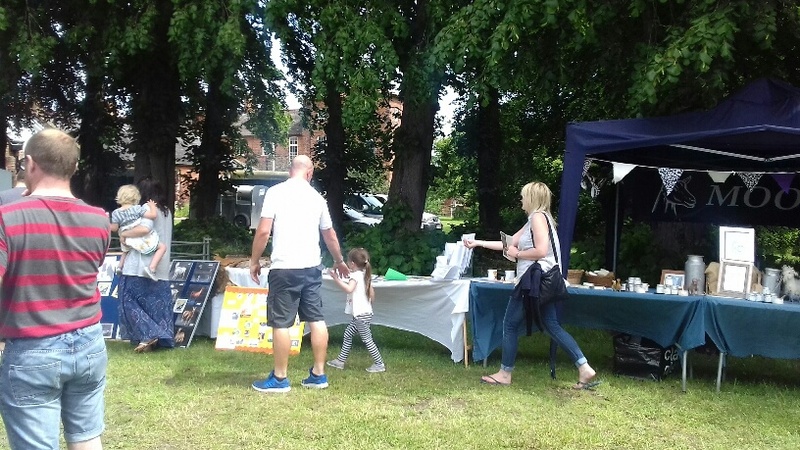 This event was well attended by the general public, families & friends. Thanks to Richard, via Mr & Mrs McNicol ( owners of Stody Lodge Estate) for allowing the N.D.G.C. 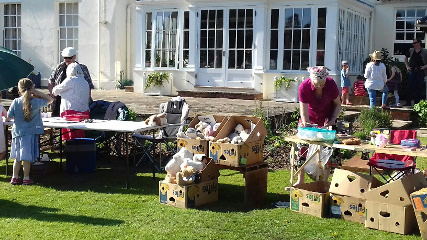 to put on their own fund raising event in the form of a min fete; on the front lawn & animal petting area in the orchard. Richard provided the kids, Sarah & Graham the chicks, ducklings, guinea pigs and pony. 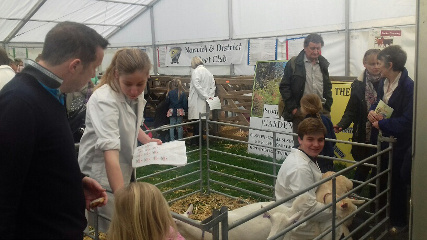 Also there were cattle & sheep in the animal zone provide by local farmer Duncan Jeary. Zoe promoted the club with the education displays. 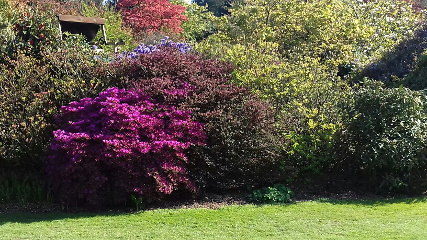 The wonderful azaleas and rhododendrons. 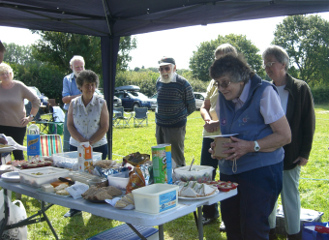 Hazel, Frances, Christine, Dave, Jayne, David, Sally, Malcolm & Mary running the mini fete. Raffle, splat the rat, bowling /ball games, find the lost kid on map, cuddly toys to buy, tombola, mask making, delicious goat shaped biscuits to buy. So here we are again at the Royal Norfolk Show Ground for the Spring Fling which is now in its 19th year. 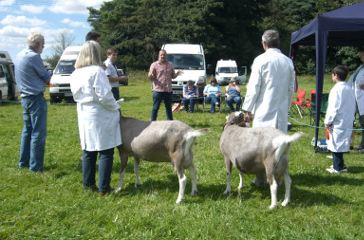 Thousands flocked onto the show ground on Tuesday 10th April. 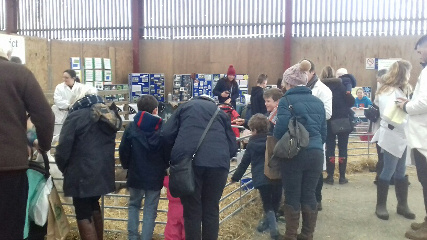 It was a sell out success with over 70 interactive stands & over 50 animals. 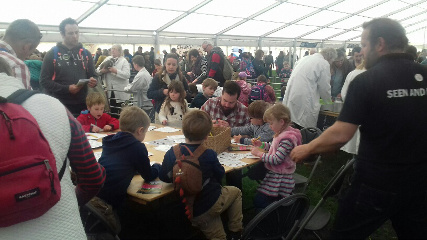 The family day is aimed at children aged 4-14 years and is a unique opportunity to learn about the countryside, agriculture, food and farming especially the link between the countryside and what appears on our plate. 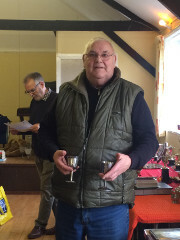 This year we set up in the re vamped farm barn (or pig shed) with Mr Mawkin and the petting farm, although a little draughty it was more centralised within the Spring fling setting on the show ground. Hazel brought 8 gorgeous kids and Christine & Jo-Anne brought the very well behaved goatlings. With a sterling team on 15 of us we were able to cover all areas of our stand throughout the day as well has have a little free time and a free hog roast too. 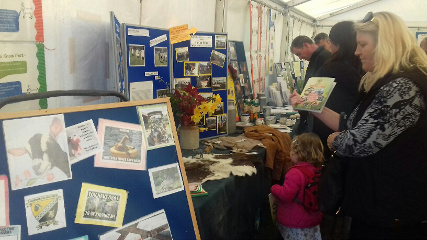 We set up the educational displays, children's goaty books and colouring area for all to touch and to learn everything there is to know about goats. 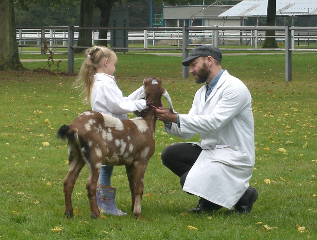 From the child's point of view it is much more rewarding to learn from a practical hands-on experience, rather than looking at a picture or listening to someone telling you how to cuddle or look after a goat. Frances with one of Hazel’s kids. 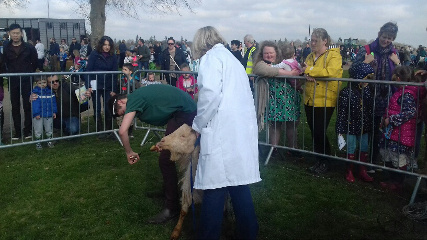 Throughout the day the team interacted with the general public, let them bottle fed the kids and groom the goatlings. 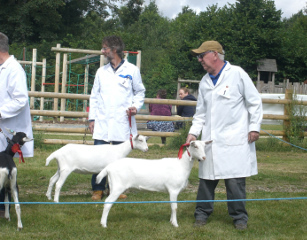 The goatlings were also taken outside into the display ring where Finn gave a running commentary on goat husbandry. Lots of people always enquire about keeping goats and we are more than willing to advise, and maybe find them one or two! 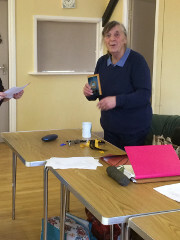 Gilly was in charge of the Mr Mawkin's official stamp with Christine and the team also handing out stickers. Our fame is travelling far! I was interviewed by Mustard TV and explained to the viewers just what our club contributes to the Spring Fling. This was aired that evening on the TV and we also got a mention in the EDP. 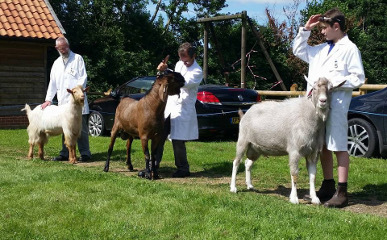 The Norwich and District Goat club were invited to provide an educational exhibition this year with a few goats for members of the public to look at. 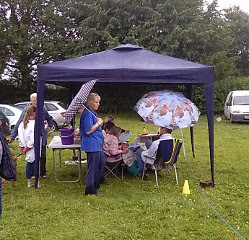 The tent was full all day with interested people and children. A rota for everyone to 'man' the tent ensured everyone had the opportunity to look round the show at their leisure which isn't always possible when you are showing in the ring. The weather was brilliant with sunshine making it extremely hot. 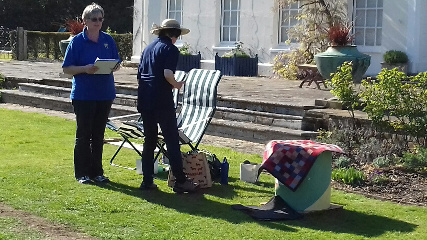 Both helpers and members of the public enjoyed the day. 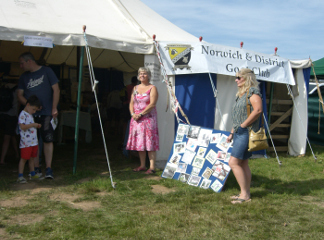 We represented the NDGC at the animal service at Norwich Cathedral on Sunday the 23rd July. It was a very pleasant afternoon, the weather didn’t look very promising to start with but The Dean said she had it on good authority that it would stay fine and consequently it did. We took Little Man who has become a particular favourite of The Dean since his appearance at Harfest last year and we also took Jeanie our BT kid. 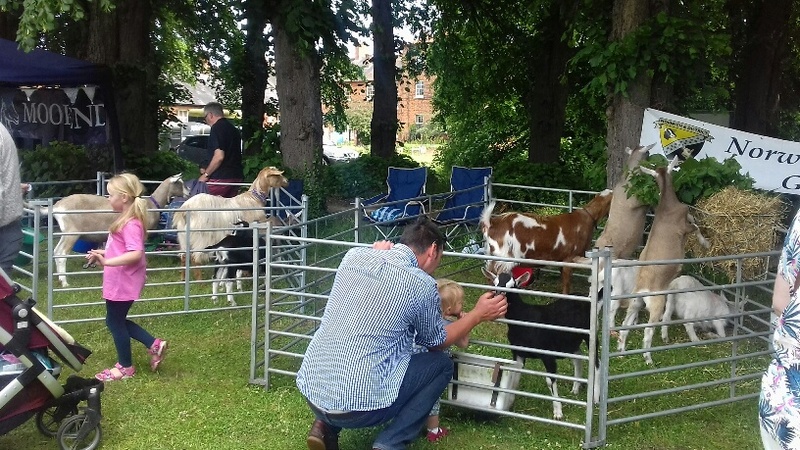 As well as many dogs, one cat and a parrot brought along by the general public there was a Suffolk horse with a large foal at foot and another foal on the way apparently, rare breed sheep, a donkey, greyhounds, pat dogs and Easton and Otley College brought along some ferrets. After the service it was quite amusing to see The Dean walking Little Man around amongst the congregation and having photographs taken (see attached photo). 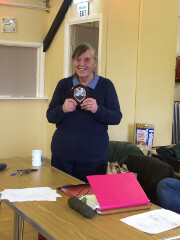 Not having judged in East Anglia for a while, it was good to be back with the ‘Home Crowd’ and doubly so as we had a lovely lunch provided by the Club Members to celebrate Jean Cunnington’s 80th birthday. 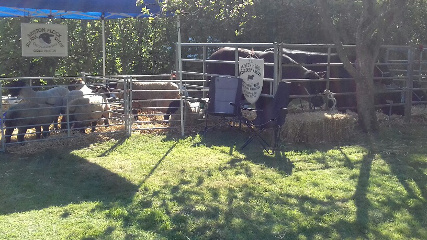 The weather was kind, sunny and not too hot so that it was pleasant for people and livestock. 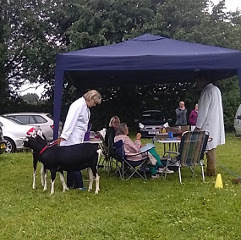 Sadly, the turnout was a bit lacking but I think this was down to two things: firstly, the entry was restricted to CAE - monitored animals and secondly many British people, including goatkeepers, had gone to Europe that week!! 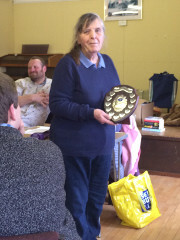 However, we had some quality goats present and Best-in-Show and Best milker went to Tereza Fairbairn with BT Anjo Carys and Reserve to Lynn Jermy with her spotty AN milker, Jemaly Pimpernella. 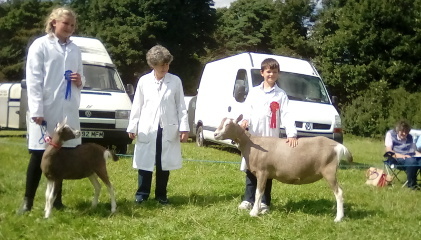 Best Kid was Sally Wilman’s Prastens Pasithia with Lynn’s Jemaly Shallon Reserve. 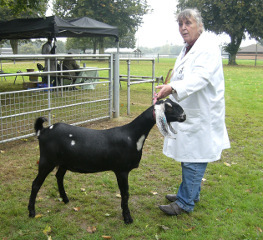 Best Goatling was Tim Francis’ Jacmar Thea, bred by Jean Cunnington and Reserve was Lynn’s Jemaly Peony. Matthew Fairbairn gave a very promising performance as Young Stockperson as did Poppy Bennett, but I felt that, proportionately, Matthew had a greater challenge which he coped with very well. Needless to say, the whole event was extremely well organised by Jo-Anne Lamb and her team: Toby Mitchell, Callum Williams and Linda Gibbons. It was a pleasure to be Judge. 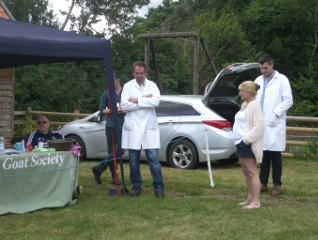 The Club was delighted to be invited to the Museum's Open Farm day. 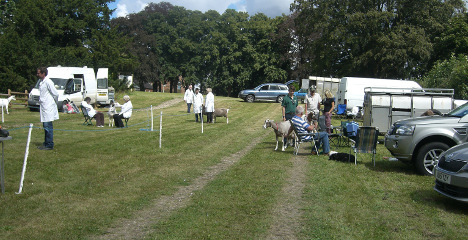 We arrived early with Richard, Pat, Sarah and Graham bringing a selection of goatlings, wethers and kids for all to see. It was a breezy day, but we were well sheltered under the trees from the elements, and flanked by sheep, Gressenhall bees and some enormous farm machinery. The museum was open as a family day at a reduced rate of £2.50 so large numbers were expected. I brought along our education displays for all to see. The children just loved touching/cuddling the kids and leading them around (which helped as show training). They were fascinated with little man and his cart. Overall it was a very busy day with us continuously discussing what it entails in, 'a goaty life style' and the benefits of belonging to Norwich & District Goat Club. Just the norm for us! Quite a few people were looking to keep goats for pets. 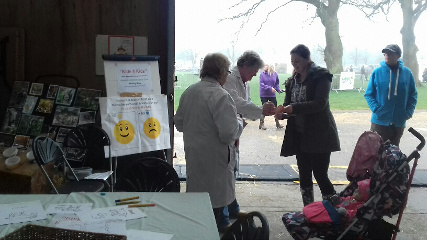 The Norwich and District Goat Club, once again was invited to participate at the Spring Fling on Tuesday 4th April 2017 at the Royal Norfolk Show Ground; under the guidance of Kate Forster, the Education Project Manager. 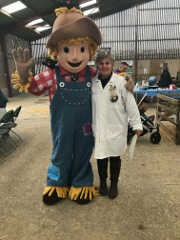 This is an event that attracted more than 5000 visitors, with over 70 interactive farm and countryside stands and exhibits, aimed at children 4-11 years old. 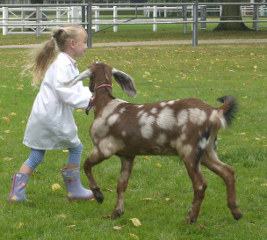 The aim is to have a fun-filled day for learning more about food, farming and the countryside. 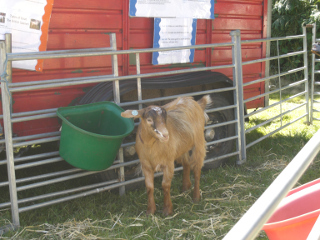 Therefore our displays included learning all about the different breeds of goats and all aspects of goat keeping. The very informative ‘Did you know?’ facts were hung around the marquee for all to read. A goat not only gives us milk but also meat, wool and leather. The milk can be made into food items such as cheese, ice cream, butter, chocolate and yoghurt. Or it can be used to make cosmetic products such as soap, body lotions and hand creams. The leather can be used to make items such as jackets and gloves. The wool finds a variety of uses from jerseys and other items of clothing, to blankets, wall hangings etc. Our display included as many of these products as possible and the ‘tester’ creams and lotions were a great ‘hit’! 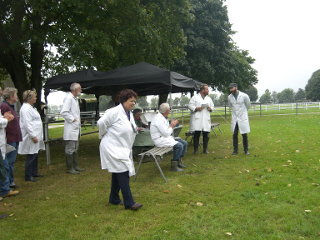 This year we were again left to our own devices in Mr Mawkin’s marquee with the Rare Breeds Survival Trust. 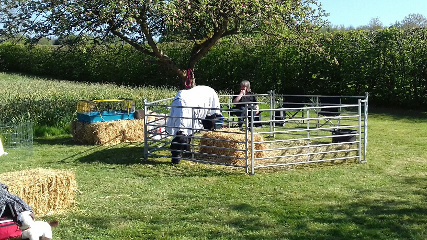 We spread our wings to incorporate 4 separate sheep hurdle pens for the 15 kids (thus enabling children to see and touch the goats freely) and several pens which held goatlings, nannies and wethers. The kids were bottle fed by children throughout the day. We made sure that interactivity was the key to learning with 2 members of the team at each pen chatting to the general public. 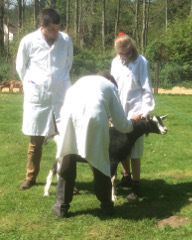 Their knowledge of goat keeping proved invaluable. The colouring table was constantly in use by everyone and used as a resting place for parents whilst their children cuddled the goats. We sold goat shaped biscuits (50p donation) making £105 for the club. Outside in the ring, we gave hoof trimming, foot care and grooming demonstrations in which the children were allowed to join in. Sarah and Graham brought along their wether (Little man) with his cart to demonstrate that goats can be used to carry people or loads. Luckily the weather was good and the rain kept away. 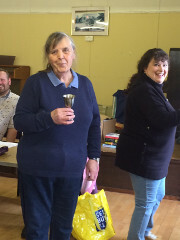 Our team included Richard, Rob, Pat, Toby, Sheila, Sally, Graham, Sarah, Chloe, Francis, Christina, Mary, Malcolm, Nicola, Callum, Jo-Anne, Hazel and her grandson, Maggie and Finn. Thank you to you all and well done! 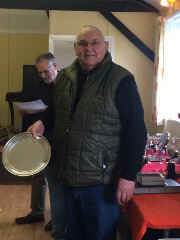 Firstly I would like to say well done and thank you on behalf of the Committee to you all for contributing to another successful year for NDGC. I would also like to thank the Committee for everything they do to ensure the clubs smooth running throughout the year. Thanks to you all in this past year the NDGC has gone from strength to strength. We have continued to put on good quality well ran successful shows. We have a fantastic interesting newsletter four times a year. We offer a quality educational portfolio with training available to our members and to the wider community. 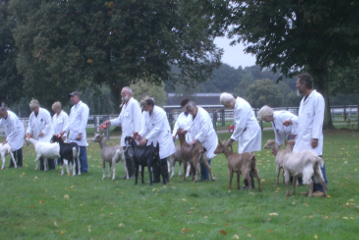 We continue to support each other and beyond in promoting good goat husbandry. 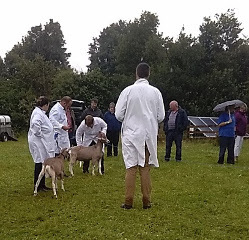 We put on social events to enable our members to get to know each other better, and to enable good informal communication regarding goat keeping and the sharing of ideas. We also provide a lifeline to some members often not goat related through friendship, a sense of belonging, providing emotional support and understanding. All of this is not too bad really considering all the club in simple terms sets out to do is promote goats, and goat keeping. Additionally we are becoming a role model for other goat clubs who are seeing our club as successful and are looking to us to provide help, and support in their clubs future success. The BGS Autumn conference was probably one of the unexpected highlights of the past year, for two reasons, Unexpected because we took on the job at very short notice, and highlight because we actually pulled it off. We were congratulated by the BGS for putting on an event that broke the mould of the previous conferences as well as it being professional informative and friendly, and also most unheard of for a BGS event we even managed to make a profit. With everything I have said already perhaps you won’t be surprised to hear that our membership is on the increase both in the NDGC and the milk recording group. However with that increase in membership comes some responsibility, and that is not to sit back and measure ourselves on past successes, we need to look forward to see how the club can evolve and improve, we need to find a way to do things better than we have done them before. We need to review what we do and when appropriate update and modernise. 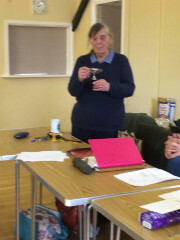 My personal highlight of the year was taking on the Show Secretary role (albeit with lots of support) for the September and Breckland shows, I once said I would never take on a Show Secretary role, but I actually did enjoy it! 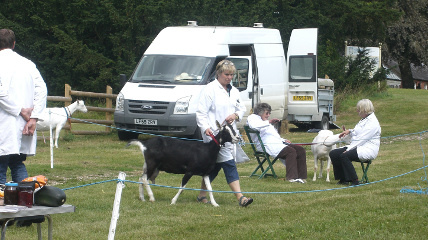 Then again I also said I would never keep male goats, exhibit my goats at shows or be on the committee. I guess though in a club like ours you never know what you will end up doing! I wish the club a successful 2017. It’s not quite such a good year to report this time in that we have spent more than our income by just over £450. 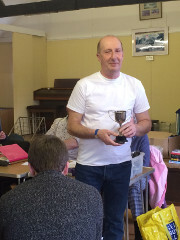 It would have been more than this if we hadn’t had a profit of £214.50 from the BGS Conference and things like the sale of biscuits at the Spring Fling and profit on sale of shirts, mugs and goat badges. 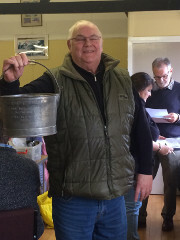 On the positive side we have made some one-off purchases which have greatly helped the club’s activities – weigh scales for the milking competitions, a gazebo, a table and display stands. We also have in hand mugs and goat badges to be sold in the coming year. 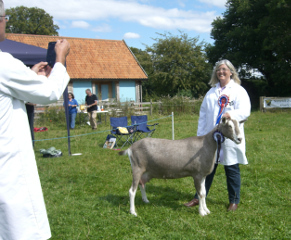 Turning to the show figures you will see that we had a fairly hefty loss on the Spring and Game shows and a not quite so big loss on the September Dairy and Breckland Show. It is hard to imagine this could be otherwise when you see that the entry fees do not even cover the cost of showground hire and prize money, let alone judges’ expenses and all the other costs. So I think we wlll have to work even harder at other sources of income to make up the difference. 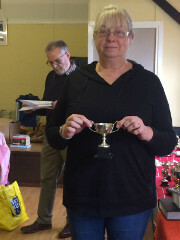 Speaking of this I should like to thank, on behalf of the club, Zoe for an enormous amount of hard work on her fund-raising projects and also to thank those who have thrown open their homes for events, which not only raise money but provide enjoyable social occasions which I believe are an important ingredient in our success as a thriving, lively and happy club. And so I plead with you to support generously every event you can in the coming year and if you can organise an event, however small or have ideas with which you need help please let your committee know. Here’s to a good year in 2017. I was officially appointed the goat club’s education officer last year. This task I embraced with enthusiasm as education is one of my many passions. 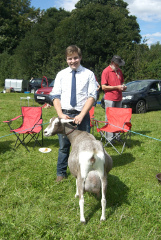 I was determined to bring the club’s image up to date and enthuse everyone with an interest in goat keeping. 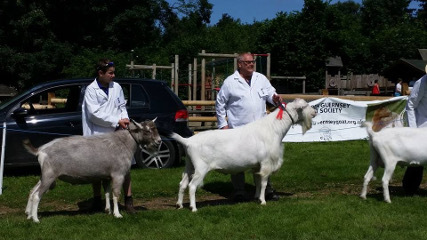 The Royal Norfolk Agriculture Association (RNAA) now insist that all their events/shows with livestock have educational displays incorporated into them by the invited clubs/organizations. 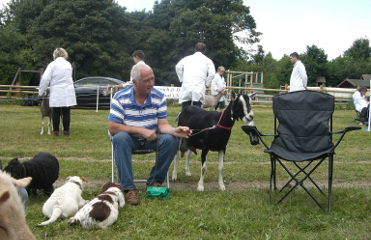 Our previous chairman Mr Alan Williams initially ‘got the ball rolling’ and spent many hours designing wonderful posters educating us about breeds and also about world-wide issues where so many countries use goats as part of their staple diet. He also designed a quiz and some hands-on activities. I then picked up the pieces… as I have a large shed to store everything in (!!!) and started to expand it. With the help of my family we now have enough resources to allow two events to be stocked with educational displays at any one time. 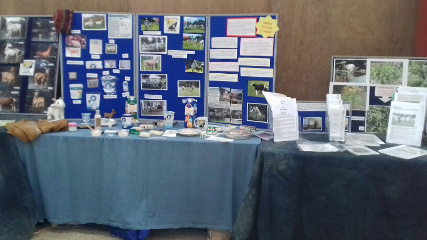 We have updated the posters and display boards, and designed leaflets to help new goat keepers. Children just love to touch and feel everything i.e. goat skin, wool, children’s books and toys. We have designed a funny goats picture board and a ‘goaty photo booth’. We even sometimes borrow Roland and Dreda’s artificial wooden milking nanny. Adults too seem to be fascinated by the fact that a goat can give us so much; not just cuddles and milk, but also cheese, cream, yoghurt, ice cream, meat, leather, wool, soap, hand cream and much more. It’s an added bonus when we have many club members willing to allow their goat kids to be available for visitors to handle, cuddle, groom and feed. 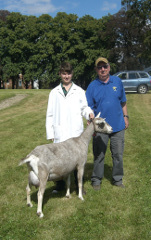 We have now built up the overall image of The Norfolk and District Goat Club well. 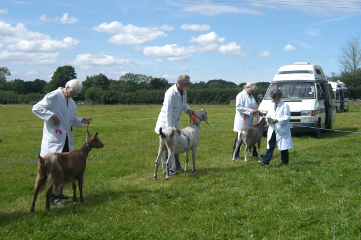 Apart from our own club events and shows, we are being invited to other events with our education displays and goats. 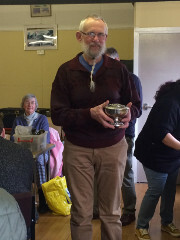 For example, the club was represented at the Norfolk Smallholder Training Group Show, Stody Open Days, Gressenhall farming events, the RNAAs Harfest and Spring Fling as well as at many other country events. 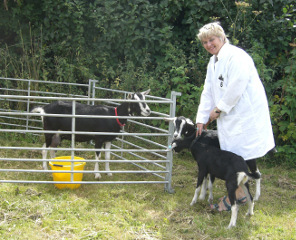 Other like-minded organisations are inviting us to host courses and give goat keeping talks. We have an amazing network of club members whose overall knowledge is phenomenal. 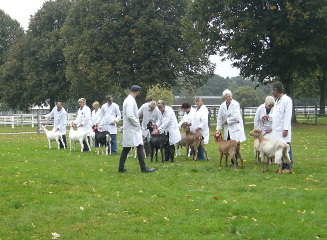 It is ‘the icing on the cake’ at all events as the general public are always very inquisitive about goats. Our members really enjoy sharing their knowledge and funny tales. They are also always on hand to help each other in times of need. Thank you to all of you for supporting me in my role within the club. Last year was my first full year as show co-ordinator. It was an interesting year, and quite a steep learning curve for me! I’d like to thank all those who helped out with the shows, the Show Committee and everyone who gave their time to help out. The shows couldn’t have happened without your support. Exhibitor numbers for last year appear to have been similar to the previous year. Looking at the income we need to try and increase numbers at the Dairy Shows, hence why the schedules will be available on the website very soon. Please help to publicise the shows and pass on my contact details if anyone would like a paper schedule. I will keep an eye on numbers over the coming shows so we can see how many exhibitors attend and how far they are travelling. 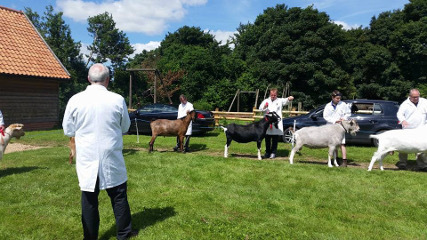 Following the interest generated by the Club’s attendance last year, we have also been invited to hold a show as part of the Wayland Agricultural Show, taking place on Sunday 6th August. 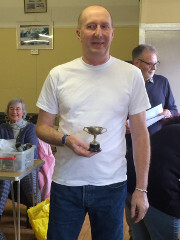 This will be a BGS recognised show and the Judge is Chris Nye. Please note an early closing date, 14th July, so that all entries can be included in the show programme. Schedules for all shows are finalised, apart from the BGS awards, which we are still waiting to hear about. Copies are available now but the award for each will be added to the versions available on the website. 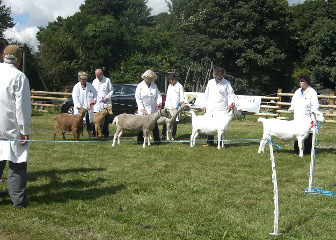 We have been approached to take part in Open Farm Sunday at Gressenhall on Sunday June 11th. I understand this will be much like the Spring Fling, in that it aims to raise awareness of small holding/agricultural life amongst the general public. 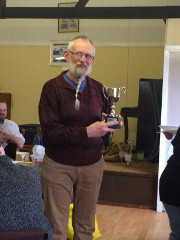 This recording year we have had 12 members recording with the club (two more than last year), with a maximum in summer of 34 goats being recorded. This is the largest number for some years. Several goats also changed hands and moved in and out of the Club. This involves quite a bit of cross-referencing, so please bear with us if you find the occasional error in your monthly statement. If this happens, please let us know, and it can be corrected easily. Nothing goes to BGS Milk Recording Committee until the end of a lactation, when everything is double-checked. 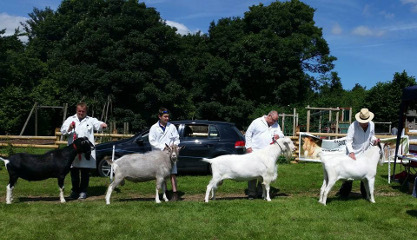 We automatically produce a 365-day lactation certificate but if you require a certificate when the goat has dried earlier, or if the goat moves home, please let us know as it is not always obvious to us whether or not this is needed unless we are given dry dates and a request for an end-lactation certificate. Similarly, if a goat moves to another owner or another Milk Recording Group, we need all the details, including dates, in order to make the data transfer. We will NOT know unless you tell us what has happened and when. We have had many fewer spoilt samples this year; but we have also had many of our samples dealt with at a different NMR laboratory! 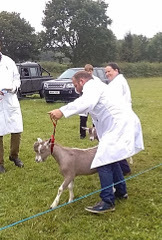 The highest recorded goat in our group for 2015-2016 was Mr Will’s 2nd kidder, R247 Timyon Minisavi Q*5 BrCh S008244D, who produced 2478kg milk with 4.06% butterfat and 3.03% protein. The highest yielding first-kidder for 2015-2016 was Monach Lantana Q*7 BT028652D with 1947kg milk at 4.59% butterfat and 2.94% protein. Hopefully, we can put this information on the website along with an encouragement for other members of our Club to join the Milk Recording Group. I know of one person who intends to join us next year. As ever, our thanks go to all recorders and check-weighers for their diligence and good time-keeping. It makes our life so much easier. We still have some recorders and check-weighers who do not round-up their weights to the nearest 0.05kg, but instead to the nearest 0.01kg. The programme does not allow us to record to this detail, so please record to 0.05kg!! 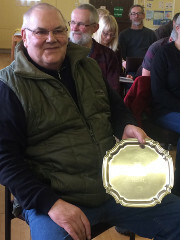 The course was held at Stody village hall on 14th January, 2017 and was presented by Will Stevenson, a vet from the Three Rivers Practice. The venue was excellent; plenty of seating at comfortable tables so it was easy to take notes. Will made good use of his overhead projector to illustrate the talk. 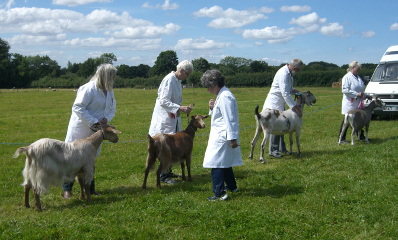 It was well attended by club members, experienced ones as well as novice goat keepers. Everyone I spoke to was very complimentary regarding both the contents and the presentation. I certainly gained some very important new knowledge. Will started his talk with a little quiz so sharpen us all up. 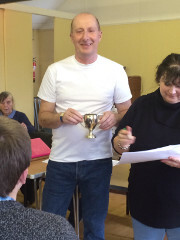 The focus of the quiz was the importance of goat production on a world scale. Then we moved quickly into focusing on the problems likely to confront the small scale producer. Starting well before kidding, he emphasised the importance of careful nutrition throughout the life of the goat. Feed too much and you get over fat animals (both male and female) who are quite content to potter about and to show little enthusiasm for the hard work of breeding and pregnancy. He demonstrated the importance of Increasing the ovulation of the doe through skilful flushing (extra nutrition) around the time you want her to take the billy. He provided details of how best to control worms and parasites and to avoid disease throughout the pregnancy, and of the need to keep her in good condition with sound feet. What I had not thought through adequately before the course was the challenge of feeding the pregnant and the milking doe. Both need considerable supplies of energy rich food to meet the demands of their body. But it becomes a fine balance between adding extra energy through additional concentrate feed (and risk the potential problem of acidosis) and supplying the needed fibre through hay and similar feeds and filling up her gut with too much material. There are no fixed rules; just careful attention to condition and need during the crucial stages of later pregnancy and milking. We were also reminded of the vaccinations needed at critical points both before and during pregnancy. Then we moved into the actual kidding event. The first message is the variability – both of pregnancy and of kidding. 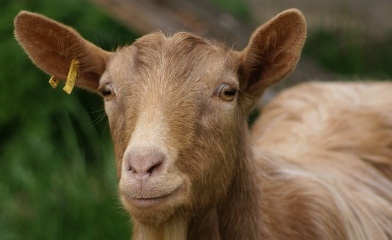 Goats, like all animals, vary around a mean – so be prepared several days before you think she is due to kid. 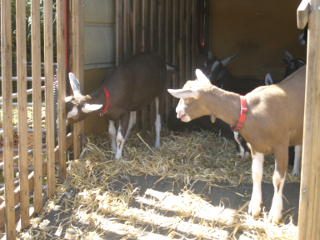 Goats also can extend their pregnancy to wait for better conditions which adds further variability. So have your materials to hand ahead of the expected date - including artificial colostrum (never borrow colostrum from a neighbour, it is just too risky). My notes include a camp bed with a good mattress – I would add, based on my lambing experience as a student, a very warm sleeping bag. The second message is keep calm. Kidding is an extended process and can take upwards of six hours. So check on her regularly but do not intervene prematurely. If a single leg emerges and she is straining, then that would indicate a problem (probably the other leg presenting badly). If you do intervene, make sure you are well washed and lubricated and then take your time. It is difficult to sort out the tangle of heads, legs, and bits just by feel. Take it easy and make sure you are confident what the problem is before starting to sort it out. The books all recommend using sterile gloves to avoid infection but they can compromise your ability to feel exactly what is happening inside the womb. Will emphasised the need to keep the kidding area fresh and clean, and careful washing of hands and arms before and after any intervention. Finally we covered post parturition nutrition and management. The doe is producing a lot of milk for her size and needs plenty of energy. A careful balance of foods will be needed to satisfy this. The kids need to take up about 10% of their bodyweight in colostrum in those important first few days so monitor their feeding carefully. We then went onto a wide ranging and interesting question and answer session which covered a multitude of goat related issues. 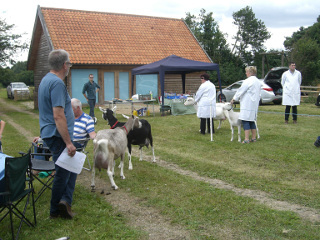 Then finally, the group tidied up the hall and left for Richard Hulbert’s goat operation on the Stody estate. I was very impressed by the warm shelter provided by the straw bale housing and the fencing layout to enable easy separation of different groups of goats. Overall an excellent day. 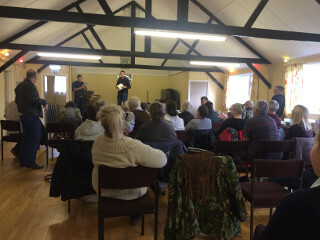 Thanks to Will for a thoughtful and interesting presentation, and to Richard for hosting the event and his organisation of the whole process and to Dawn Will, Finn’s mum who ran the refreshments kitchen for us – much needed on a freezing cold day! A dozen of us gathered together to hear about kidding, what we might expect and some of the aspects we may encounter. It was a really friendly session and is likely to be followed up by informal chats over a cuppa from time to time. 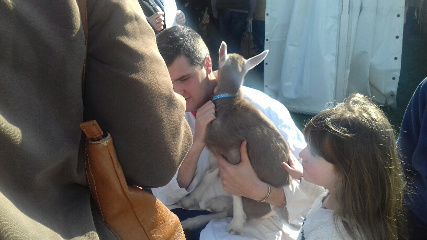 I had a goat kid that day but the attendees missed the event by about half an hour. A single female pure Toggenburg kid, was born and is doing really well. Hopefully there will be further training sessions in place throughout the year so if you missed out this time or have something specific you would like to learn about please let us know. Hope everything goes well with your kidding. 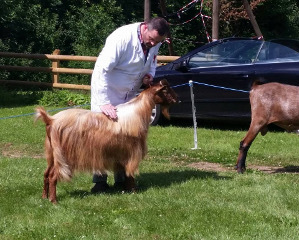 We all know that a goat show is a place we go to show our goats, but ….. it is so much more. We catch up with our old friends, and sometimes make new ones. We exchange tips and stories, we listen to a few ‘moaning minnies’, and laugh, and sometimes we cry. We do our best, and our goats are sometimes good and sometimes impossible. This autumn show was all of these, and so much more! Our chairman Richard and Jo-Anne made this into one of the best shows I have seen. Any problems, which were few, were dealt with quickly. 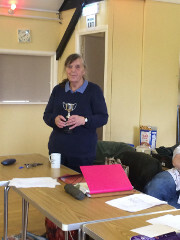 Toby, Hazel and Linda did a good job, and although the first judge was not everyone's ‘cup of tea’, our second judge was well liked by most, and had a very nice manner with a good sense of humour. 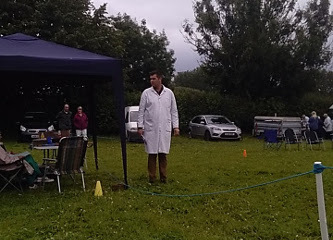 The weather was not the greatest but it cheered up just enough for us to do the shows pretty well. The Saturday night BBQ went down very well, with a big thank you to Zoe and everyone who helped. 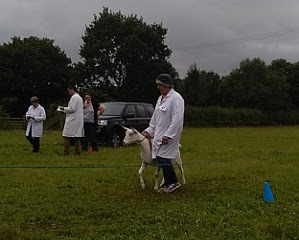 Although a lot of our goats milk was down, (and no wonder given that the weather was suddenly so cold and wet) it seemed to me that most of the people, even the ones who did not win, went home in good spirits. A big THANK YOU goes to everyone who put up the pens and took them down again. I hope to see you all at the BGS conference in October, and that all your old and new goats have a good end to the year. 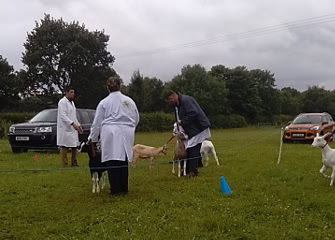 This was really my first goat show and it was wonderful to see lots of friendly faces both human and goaty! 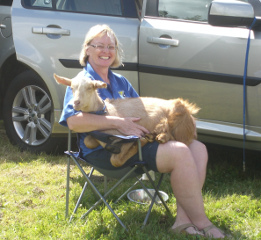 See the picture below of Jo-Anne with one of her goat kids on her knee enjoying the warmth of the sun and looking every bit as relaxed as a cat or dog might be! Everyone was very cheerful and also stoic about the placing of their goats when being judged, and kind and considerate of others. It was interesting listening to general comments about judges and judging, and noting how comfortable people were in today’s judge. 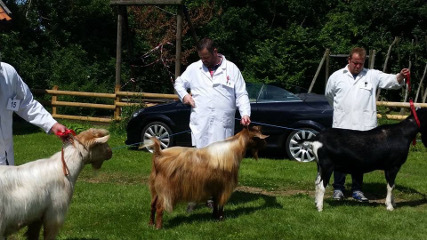 It was after this event and discussion on judges' particular likes and dislikes in goat looks, that I was sent (anonymously), the little story of a Golden Guernsey that I included in our last newsletter. Some judges liked her and some didn’t but she turned out, just like the Ugly Duckling, to be one of the nicest and prettiest goats in the neighbourhood. ‘Beauty is in the eye of the beholder’ I guess! The only negative bit of the day was that Gressenhall staff hadn’t unlocked the gate to the side which meant anyone needing the loo had a long walk round, or a climb over a fence. I chose the latter, just to prove that my recovering broken knee and leg, though stiff and painful times did still work when desperate! Anyway, the club show was fun, friendly, relaxed and quite quite lovely! Thank you one and all! It was a beautiful day for the show again this year with many visitors and some excellent stalls selling or demonstrating a wonderful variety of goods and services. I was on the gate for an hour around lunchtime and can say that it was pretty hectic with visitors coming and going right through the day. 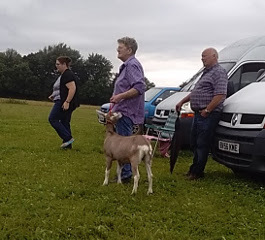 The goat club was well represented with Diane, Richard, Sheila, Dave, Zoe, Beau and Peter doing ‘a sterling job’ of chatting to people, explaining aspects of goat keeping. Throughout the day it was nice to see a constant flow of other club members stopping at the stand to say hi and lend a hand. 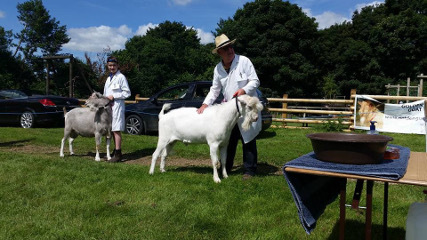 It really is a great day out at the Smallholders Show enabling the club to promote the benefits of goat keeping and of course club membership. 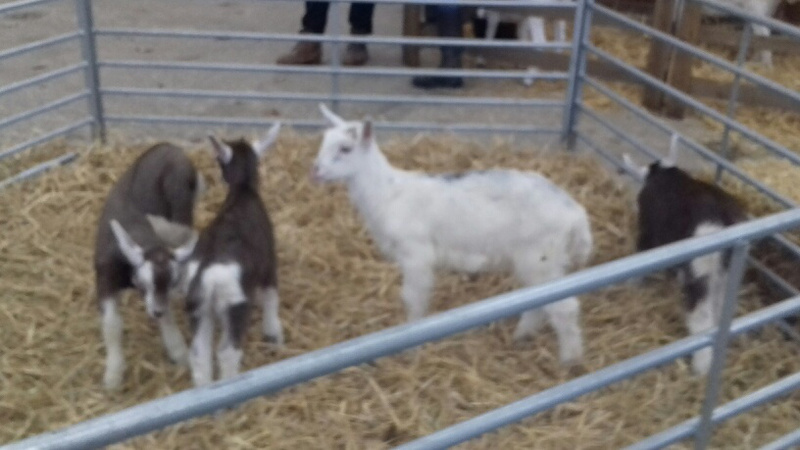 As ever, the gorgeous little goat kids proved to be a ‘people stopper’! Three of the goat kids present were under two weeks old and drew quite a crowd of all ages wanting to feed and cuddle them. 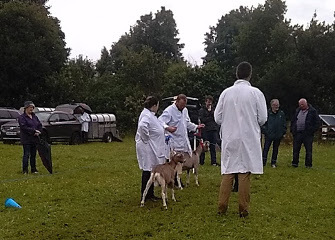 The parade of goats in the ring in the morning and again in the afternoon went well and served to promote the goats even further for those who hadn’t managed to get through the crowds milling round the goat pens. Zoe brought along the educational element of the club display, and set it up. 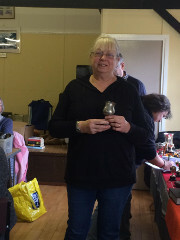 It was good to see such a good education stand on behalf of the club, considering at least half was on display at the Wayland show that same day! It’s surprising how much time Zoe has spent, and how much information she has collected. In a separate stall just next door was Zoe with her goats’ milk cosmetics. 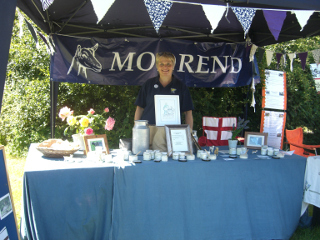 There was a great range of goods - soaps, lip balms, creams, lotions etc with testers for you to try too. 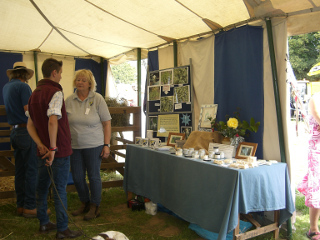 Everything was beautifully packaged and looked really professional, making a great promotional addition to the goats’ stand. 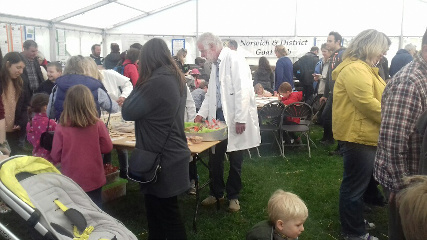 For the last couple of hours of the show, I was ‘on duty’ in the NSTG members tent and lots of visitors came in to join, having just come from the goats and still full of enthusiasm. The feedback they gave re goats was fantastic. 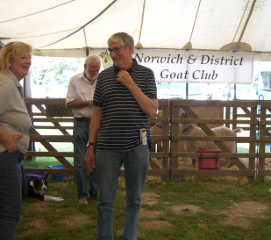 As they signed up to join the NSTG, I was also able to give ‘Why don’t you also join the Norwich and District Goat Club?’ ‘mini-promotion’, so I hope some have done so. All in all it was a great day. Sincere thanks to everyone who came along. We met some lovely people at the Show and already have signed up some new members from the event. In addition one family has purchased their first British Toggenburg kid after falling in love with her on the day! More events will be added as information becomes available.